Earlier this year Mayor de Blasio and the Queens Borough President, Melinda Katz, formally announced the launch of the Jamaica Now Action Plan, a collaborative effort between city agencies to spur the revitalization of Downtown Jamaica and surrounding neighborhoods. The Downtown Jamaica Transportation Study is part of this collaborative effort to address traffic and transportation issues. Downtown Jamaica will be experiencing more growth and development in the near future. Some of these developments include hotels, residential complexes, commercial establishments, and institutional facilities, such as the expansion of the York College Academic Campus. With new developments, various infrastructure improvements, and increasing traffic, a comprehensive assessment of traffic and transportation is necessary. The Department of Transportation will work with residents, local stakeholders, and elected officials to identify traffic, transportation, and safety issues and to develop improvement measures. The primary study area is bounded by Hillside Avenue to the north, 183rd Street to the east, Liberty Avenue to the south, and the Van Wyck Expressway to the west. The secondary study area is bounded by Union Turnpike to the north, 193rd Street/Farmers Boulevard to the east, Linden Boulevard to the south, and 130th Street to the west. 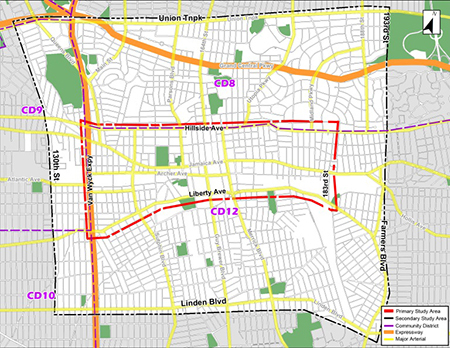 This broad area represents parts of Community Districts 8, 9, 10, and 12 and includes the Briarwood, Hillcrest, Kew Gardens, Richmond Hill, South Richmond Hill, Jamaica, Jamaica Hills, Jamaica Estates, Hollis, and Holliswood-Terrace Heights neighborhoods. The primary study area, which will be subject to a detailed traffic study, is transit rich with three subway station hubs: Sutphin Avenue-Archer Avenue (LIRR, AirTrain, E, J, Z, and numerous buses), Jamaica Center/Parsons Boulevard/Archer Avenue (E, J, Z, and numerous buses), 179th Street (F and numerous buses), and one bus hub: 168th Street (numerous NYCT and NICE buses). The Downtown Jamaica Transportation Study will build on previous and on-going DOT initiatives with community stakeholders in the study area to improve safety and reduce congestion. The study process will involve extensive community outreach. For more information on the Downtown Jamaica Transportation Study, please call 212.839.7766 with your questions or comments.